Most of my vegetables are thriving, with only a few disappointments. 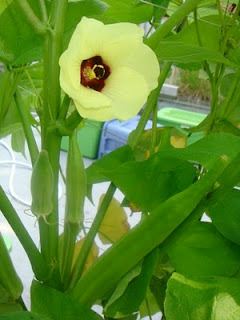 Okra flowers are stunning. The long green pods, briefly grilled and tossed with olive oil and curry powder, are surprisingly tasty. 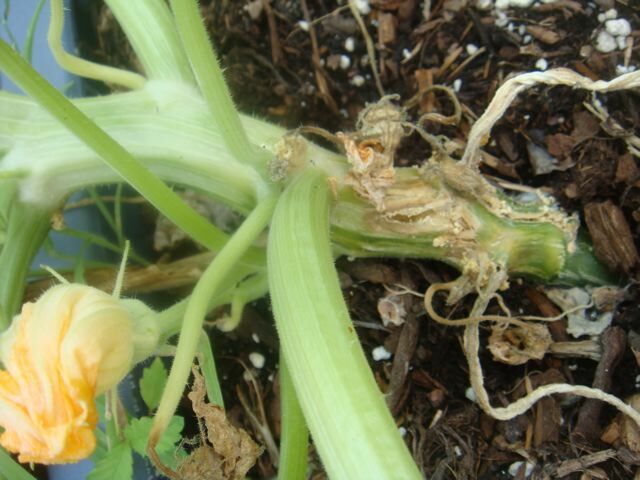 Squash Vine Borers got my acorn squash again this year. It looks like I'm going to start using floating row covers if I want any type of squash. Carmona sweet peppers are just starting to ripen. The plants are prolific, and the fruits are large. Perfect roasted and turned into muhummara. Co-blogger Debbie came over for a tour of my roof. Peppers are behind me, melon and beans in front. My eggplants have really produced. Here are some Diamond. I think, maybe they're Black Beauty. 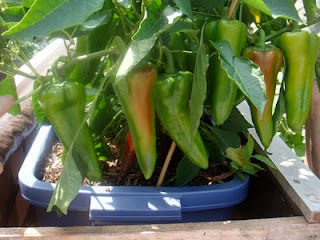 In addition, I have a couple of asian varieties, Ping tung long and Udumalapet. If you're looking for ideas on what to do with all your eggplant, crack open an Indian cookbook. They've been making eggplant delicious for 5000 years. About half my tomatoes are going strong, the other half have black fuzz and dying flowers. Rooftop squirrels seem to be taking more than their share this year. Your garden looks fabulous! and delicious! Keep up the good work! 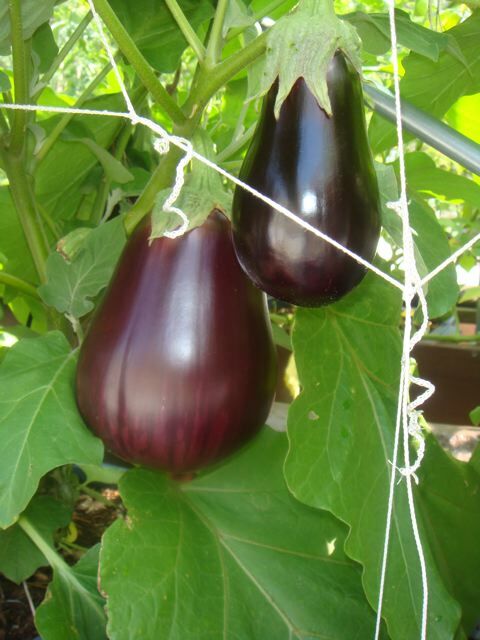 Your eggplants and okra look great! I didn't know you had squirrels eating your tomatoes too. I have read that squirrels dislike the scent of garlic so I am testing out the theory. I have taken garlic, smashed it up and put it in a nylon sock, I also included some garlic oil dipped in a cotton ball. It's now hanging on the branches of the plant. Yes, it looks silly but I prefer it over chemicals. I'm on a quest to save my tomatoes from those darn critter! Someone please make a No Pest Strip for Squirrels! Anyone else have any other suggestions? "It has hibiscus-like flowers and seed pods that, when picked tender, produce a delicious vegetable dish when stewed or fried. When cooked it resembles asparagus yet it may be left raw and served in a cold salad. The ripe seeds have been used as a substitute for coffee; the seed can be dried and powdered for storage and future use." Thanks for the kind words. We'll get together soon. And if the worst happens, Debbie, the squirrels will have their palates elevated. Adore eggplant, just started liking okra. Will check you out later. Beautiful Garden!! I tried to become your follower but I don't think you have your follow button activated. I double checked, and I don't think there's anything we're doing that prevents you from Following our blog. If you go to your Blogger Profile page, you can add our blog by clicking on the blue "Manage Blogs I Follow" tab. 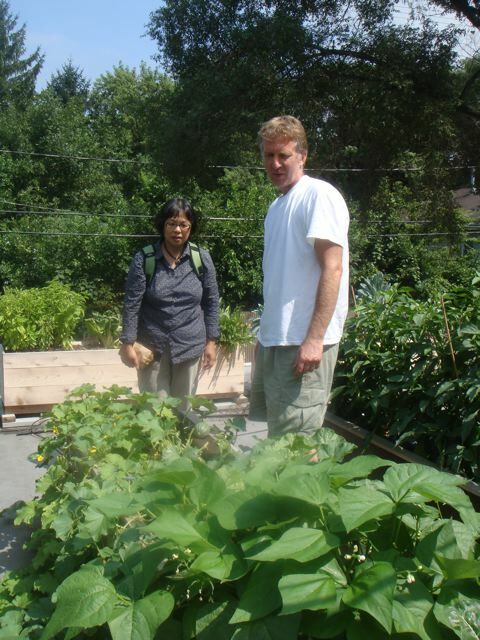 they are look good and healthy organic veg.